The shock wave induced by the supersonic flight model and the turbulent flow induced by the free-falling grid were interacted using the time-synchronized launch operating system of the aero-ballistic range. The time-synchronized launch system was successfully done. However, the clear effect of the turbulence on the pressure signature has not been obtained because of the mismatch of the shock Mach number and the induced turbulent Mach number. D-SEND#2, which is similar to the aircraft, scale model was launched with high-precise attitude control by the rectangular-bore core aero-ballistic range, and the near-field pressure around the model was measured. The obtained pressure signature was compared with the numerical simulations, and these pressure signatures agreed well except for the pressure wave originating from the main wing. From these experiments, the experimental capability of the aero-ballistic range was extended. 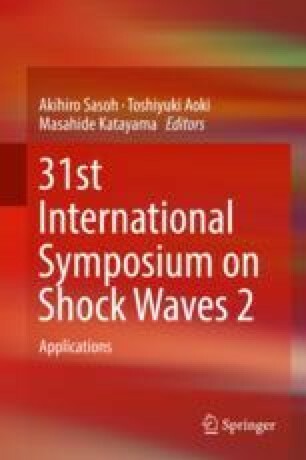 The authors would like to gratefully thank Messrs. N. Shiraki, M. Nakakimura, and K. Yamamoto, Technical Division, Nagoya University, for their assistance. This research was supported by JSPS KAKENHI, Grants-in-Aid for Scientific Research (A), No. 15H02321.